A series of articles coming from the Music and Movements in Indonesian Cultures has been published in the online journal, Inside Indonesia. Thanks to the editing of Dr Julian Millie, the site now has an introduction by Monika Swasti Winarnita (Moving with the Times) and a selection of pieces including Surviving Conflict by Margaret Kartomi, Gestures of Power and Grace by Paul Mason, Heritage and Paradox by Sarah Andrieu, A second revolution by Sandra Bader, and Dancing the Nation in Migration by Monika Winarnita. Please do not hesitate to contact any of the presenters with regards to work they have published. The Music and Movements in Indonesian Cultures Conference, Workshops and Performance took place at the Consulate of the Republic of Indonesia in Maroubra under the co-organisation of Macquarie PhD student Paul Mason, and local Indonesian artist and choreographer Alfira O’Sullivan. Through a grant from the ARC Asia Pacific Futures Research Network, Paul and Alfira were able to invite numerous researchers, teachers and performers from around Australia and Indonesia. The Conference was opened by Professor Margaret Kartomi who has conducted over 40 years of research in Indonesia. She delivered an address about practices of body percussion in Aceh and Sumatera with spine-tingling footage of Sufi traditions, regional dance performances and competitions. Her presentation was inspiring to the younger researchers as well as the wider public in attendance. It was beautifully complemented by a hands-on body-percussion workshop delivered by Murtala, a talented Acehnese choreographer.At the end of three hours of hand clapping, body slapping and finger clicking, all the participants were able to string together sequences of Acehnese dance. The second day featured a presentation by Sarah Anais Andrieu, an Anthropologist from the Ecole des Hautes Etudes en Sciences Sociales (Paris, France). She arrived directly from two years of fieldwork in West Java to present on a Sundanese form of puppet theatre called Wayang Golek. She charmed the audience with footage from this incredible form of original entertainment and a discussion about its status within Sundanese and national Indonesian culture. This presentation was followed by two researchers from the Monash Asia Institute Monika Winarnita Doxey and Dr Nicholas Herriman. Monika presented her ongoing PhD research in Anthropology at RSPAS ANU on the rich dynamics of the Indonesian migrant community in Western Australia. Dr Herriman gave a captivating discussion about Indonesia’s Post-war Intellectuals and the concept of Rakyat in Indonesian literature in the late 1950s and early 1960s. The morning research presentations were supplemented by practical workshops in the afternoon. Alfira O’Sullivan, director of the Sanggar Suara Indonesia Dance Troupe, taught the participants Javanese dance in a fun and entertaining style. Paul Mason, drawing upon his recent PhD fieldwork in West Sumatera and West Java, ran a session on the Indonesian martial art of Pencak Silat. By the end of only the second day, participants had already exercised their brains and bodies to their fullest! Professor J. Lowell Lewis opened the third day with an engaging discussion about the primacy of music and movements in human communication. He stimulated dialogue with his audience and provided an excellent academic platform for the proceeding presenters. The presentations that followed covered the areas of popular and traditional Indonesian music, children’s songs and the translation of Indonesian experiences into Australian Contemporary Dance. Dr Jonathan McIntosh, an ethnomusicologist based at The University of Western Australia, delivered a brilliant exposé of changes occurring in the children’s songs repertoire in Bali. His use of sound recordings, movies and transcriptions revealed rigorous and comprehensive research that warmed and inspired his audience. Sandra Bader from Anthropology at the School of Political and Social Inquiry, Monash University, gave a thought-provoking pre-fieldwork presentation. She spoke of her theory and methodology in studying the popular music genre of Dangdut with respect to sense of self. Independent Dance artist, Ade Suharto, talked about her process as a dancer with experiences informed from her Indonesian heritage and traditional dance-training. Rebecca Miatke, a Masters student from LaTrobe University, spoke about the Gong in Javanese Philosophy which demonstrated her deep and intimate respect for Indonesian society and culture. Rebecca’s exploration of how the gong represents a guiding principle of harmony in Javanese society beautifully led into the afternoons workshops on Indonesian music. Deva Permana, Ron Reeves and Efiq Zulfiqar coordinated a fun and vibrant workshop on interlocking—an essential principle of Indonesian music. They demonstrated their musical prowess with a short performance and then led the participants through the application of interlocking in various Indonesian musical styles. Participants enjoyed learning Kecak vocal interlocking, drumming and Gamelan techniques. It was a great way to finish off the three day event. Perhaps the highlight of the Music and Movements in Indonesian Cultures Conference was the performances held on Tuesday night. Over forty Indonesian and local artists entertained a packed house with music, song and dance from across the archipelago. The enthusiasm was fierce and the energy incredible as the audience enjoyed almost two hours of non-stop performance art. In music and dance, practice is a form of research and performance its publication. The event included many modes of research presentation with rich exchanges among researchers, between researchers and artists, and with the general public. It offered a beautiful space for multicultural dialogue, pluridisciplinary discussion and international networking. Musical movements, body movements, political movements, social movements, cultural movements, spiritual and religious movements, all are involved in the dance of life. 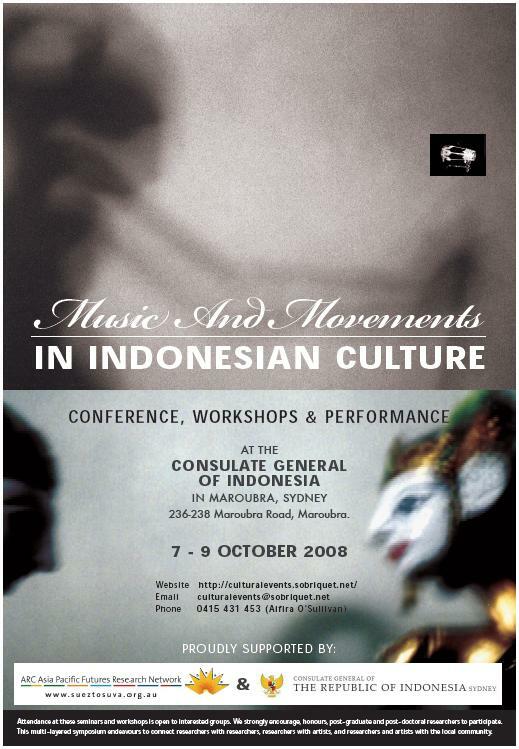 The current conference focuses on music and movements in Indonesian culture. The seminars and workshops are open to anyone with an interest in Indonesian Culture. We are inviting students, academics and researchers in the field of Indonesian studies to present at this international event to be held at the Consulate General of Indonesia in Sydney. Timetable has now been updated! · Peserta : penelitian local dan internasional dan seniman Indonesia dan seniman Indonesia-Australia. Konferensi antar displin ini akan menkombinasikan presentasi penelitian dari mahasiswa lokal dan internasional serta workshop tari dan musik dengan seniman Indonesia. Pendaftaran telah dibuka untuk mahasiswa S2 dan S3 yang ingin berpartisipasi dalam presentasi. Seniman yang mengajukan proposal workshops juga akan kami undang untuk memberikan applikasi anda. Musical movements, political movements, social movements, cultural movements, spiritual and religious movements! What are your Indonesian research interests? An interdisciplinary conference combining research presentations from local and international scholars as well as practical music and dance workshops with Indonesian Artists. Applications are now open to postgraduates and post-doctorates who wish to present, attend and participate. Artists with workshop proposals are also invited to submit applications. There are 22 posts and 0 comments so far.